Oklahoma State Cowboys guard Stevie Clark during the second half against the Memphis Tigers at Gallagher-Iba Arena. Oklahoma State won 101-80. 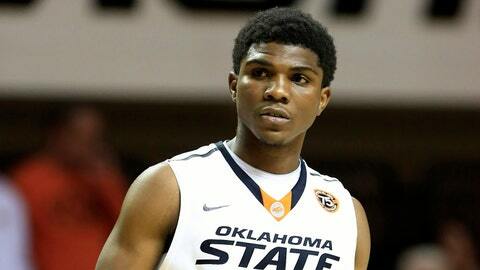 Oklahoma State freshman guard Stevie Clark was arrested Wednesday on suspicion of marijuana possession. Edmond police spokeswoman Jennifer Monroe says Clark was a passenger in a vehicle that was pulled over for a seatbelt violation. Police discovered marijuana in the vehicle and arrested Clark and the driver on possession of marijuana complaints. Clark, a backup point guard, is averaging 7.0 points for the sixth-ranked Cowboys. The school didn’t immediately comment on Clark’s arrest. Oklahoma State (12-1) opens Big 12 Conference play Saturday at Kansas State (10-3). On Tuesday, coach Travis Ford announced that starting forward Michael Cobbins will miss the rest of the season with a ruptured Achilles tendon. Cobbins, who will have surgery Thursday, was injured in Monday’s win over Robert Morris. Cobbins, who started all 13 games, was averaging 4.5 points and 4.3 rebounds.